Many of the people in the 34th Beijing International Marathon wore facemasks as they ran the 26-mile race on Oct. 19. The air was so polluted that the Beijing Municipal Environmental Monitoring Center advised children, the elderly and the sick to stay indoors, and everyone to avoid outdoor activities. At one point, the U.S. Embassy’s monitor found 16 times more particulate matter in the polluted air than the level the World Health Organization deems acceptable. China’s rapid growth over the last decade has required vast amounts of energy. According to a new analysis by Climatescope, from 2008 to 2013, annual energy consumption rose 51 percent, with almost 70 percent of electricity coming from the burning of dirty coal. Largely because of all its coal use, China became the world’s biggest carbon polluter in 2006, surpassing the U.S. In 2012, China burned almost as much coal as the rest of the world put together. 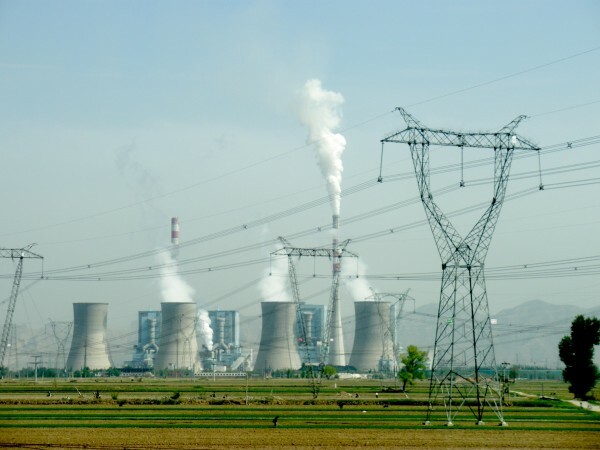 The burning of fossil fuels to power China’s development and the country’s rapid industrialization have resulted in severe environmental pollution. According to a 2012 report by the Asian Development Bank, less than 1 percent of China’s 500 largest cities meet World Health Organization air quality standards; and of the world’s 20 most polluted cities, 16 are in China. Seventy-five percent of lakes and rivers and over half the groundwater are contaminated, mainly from manufacturing and agriculture. More than one-fifth of farmland is polluted. 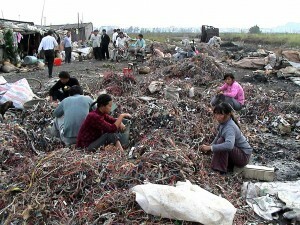 The air, water and soil are also contaminated by toxic heavy metals from the enormous amount of electronic waste that is sent to China for recycling. 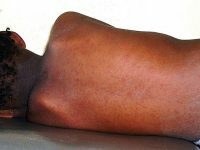 According to a 2010 environmental health report, the noxious environmental conditions in China each year result in 2.4 million premature deaths from cardiopulmonary and gastrointestinal diseases, cancer, neurological damage and other infectious diseases. In 2010, air pollution alone contributed to 1.2 million deaths. The growing Chinese middle class is increasingly concerned about environmental conditions, with many city dwellers moving to less polluted places or sending their children abroad. One-third of Chinese respondents to a new Pew Research Center poll said issues involving “pollution and the environment” pose the greatest threat to the world. 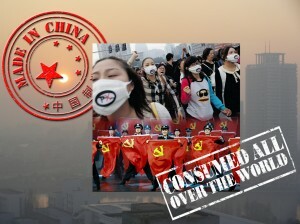 Leading former Communist Party official Chen Jiping acknowledged that pollution has become the main cause of social unrest in China, and government officials worry that protests about environmental issues could lead to more general political unrest. Cell phones and social media have enabled activists and environmental groups to more easily connect with one another and organize. According to Yang Zhaofei, vice-chair of the Chinese Society for Environmental Sciences, the number of environmental protests have increased 29 percent each year since 1996. Recent protests have included demonstrations against a waste incinerator plant in Zhejiang province, a huge lithium battery factory planned for Shanghai and a large petrochemical plant in Ningbo. Although the government sometimes arrests protesters, in the face of these protests, it backed down. 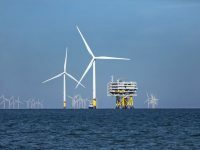 Because leaders understand that the environmental situation is dangerous both economically and politically, they are taking decisive action to pursue green low-carbon development. “There is no turning back in China’s commitment to a sound ecosystem. We have declared war on pollution and earnestly fulfilled international responsibilities,” Premier Li Keqiang said in September. In 2013, China’s carbon intensity (a way of measuring carbon emissions per unit of gross domestic product) fell almost 29 percent from 2005 levels, reported Vice Premier Zhang Gaoli at the U.N. summit in September. 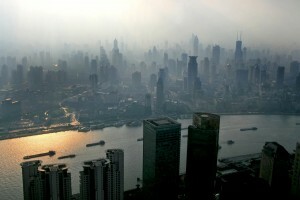 He also announced that China intends to reduce its carbon intensity by up to 45 percent by 2020. To reach this goal, in 2016 China will launch the world’s largest carbon trading system, having tested seven regional pilot systems in Beijing, Shanghai, Tianjin, Shenzhen, Chongqing and two provinces. Carbon dioxide emissions from coal plants, factories and other big emitters will be capped, and permits must be purchased for emissions that exceed the cap. By 2020, China’s carbon market is expected to be twice as large as the European Union emissions trading system and worth up to $65 billion. Earlier this year, China strengthened its Environmental Protection Law for the first time since 1989, making it easier to fine and detain polluters, take public-interest legal action against those who violate the law, and link the performance reviews of local officials to the environmental performance of their regions rather than the economic performance. China’s Renewable Energy Law includes a feed-in tariff (a fixed price above market prices for renewable energy sources that sell into the grid) to encourage renewables and a requirement for grid operators to purchase all the renewable energy available in their regions. A renewable energy quota sets the amount of energy that provinces and cities must get from renewable sources. The government is also planning to spend $277 billion to deal with air pollution and $333 billion on water pollution. Because China instituted strict policies to curb coal consumption at the provincial level, coal use in the first half of 2014 dropped for the first time this century, while the economy continued to grow at 7.4 percent, reported Greenpeace. Output at 14 of the biggest coal producers is being cut, and beginning Jan. 1, the sale and import of highly polluting coal with high ash and sulfur content will be banned. Also, 50,000 small coal fired plants are being shuttered, and no new coal plants will be built in large eastern cities like Beijing and Shanghai. In 2020, coal burning will be banned altogether in Beijing and replaced by renewable energy. To deal with carbon emissions, China is also collaborating with the United States on carbon capture, utilization and storage. The Earth Institute’s Lenfest Center for Sustainable Energy is working with Zhejiang University on researching pre-combustion and post-combustion carbon capture and developing new technologies. 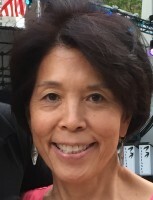 Alissa Park, Lenfest Chair in Applied Climate Science and interim director of the Lenfest Center, explained that one new technology involves the carbonization of industrial waste, such as steel slag. Carbon dioxide reacts with the alkalinity of steel slag to produce an artificial limestone that can be used as a building material. The strategy provides a way to both offset CO2 and get rid of solid waste. Another technique being developed involves using compressed carbon dioxide as a hydraulic fracturing fluid. China has the largest shale gas reserves in the world and is intent on developing them. But because they are deeply buried under difficult geological formations in dry regions where the soil is less porous, hydraulic fracturing or fracking will require twice as much water as is used in the U.S.—and China already has a serious water shortage problem. Researchers are exploring compressing carbon dioxide into a liquid that can be used for fracking, though a lot of energy will be needed to pressurize the CO2. 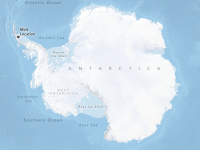 “There are an increasing number of projects identifying, evaluating and defining potential sites for carbon capture, utilization and storage. Some are already taking CO2 from coal plants,” Park said. “R and D wise, China is committed.” Demonstration projects in China have already captured about 270,000 tons, utilized over 120,000 tons and stored 100,000 tons of carbon dioxide per year, according to the World Resources Institute. China’s energy consumption is expected to double by 2030, so to simultaneously cut fossil fuel use and keep the economy healthy, China must develop alternative energy sources, including nuclear power. It currently has 22 nuclear plants operating and 26 under construction, with more in the works, many with advanced designs. The Renewable Energy Policy Network for the 21st Century (REN21) reported that China has become the world’s largest investor in clean energy technology, spending $61.3 billion on renewables in 2013. (China had more hydropower capacity and generation in 2013 than any other country according to REN21’s report.) 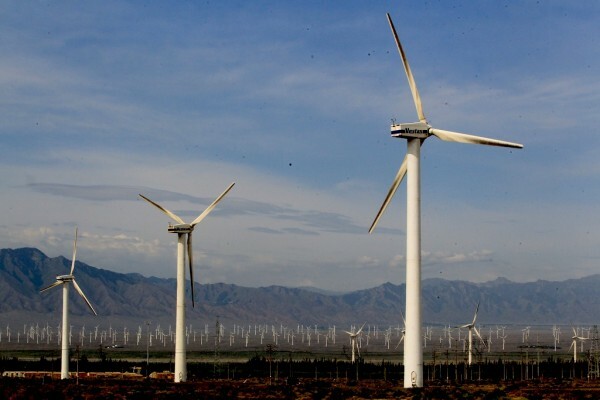 China’s goal is to generate 550 gigawatts of electricity from renewables by 2017, almost 50 percent more than in 2013. 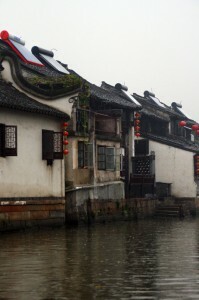 Solar thermal systems are on rooftops everywhere in China. In the first three quarters of this year, China invested $20 billion in renewables, with over half going into solar technologies. This investment should enable the country to add 14 gigawatts of solar power in 2014 alone—more than the entire solar capacity of the U.S. The International Renewable Energy Agency’s annual review reported that China’s solar photovoltaic value chain employed 1.6 million in 2013, while its solar thermal sector supports 800,000. Since 2005, production of solar cells has expanded 100 times, and costs have dropped dramatically. Unfortunately, the U.S. and the European Union have placed tariffs on solar panels imported from China, slowing global development of renewable energy sources. Nevertheless, Bloomberg New Energy Finance projects that by 2030, fully half of China’s electricity will come from wind and solar sources. 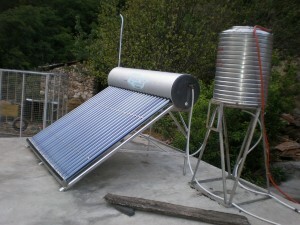 Solar thermal on traditional homes. Wind power capacity quintupled in the last four years said an article in Nature, making China the world’s fastest growing wind market. It aims to produce 200 gigawatts of electricity from wind by 2020, which would support 500,000 jobs in the sector. China is also building 19 high voltage lines to handle the increased transmission from renewables. In 2015, stricter fuel economy rules go into effect, requiring carmakers to average the equivalent of 34.1 miles per gallon across their fleets; by 2020, requirements will go up to 47 miles per gallon. Meanwhile, China’s electric car sales are beginning to rival those of the U.S., the world’s largest electric vehicle market. In 2016, the central government and some regional governments will require 30 percent of their vehicles to be electric or hybrid. Shenzhen, the city with the second most vehicles in China after Beijing, is aiming for 2,500 electric taxis, 3,000 hybrid-electric buses and 1,000 all-electric buses by 2015. At that point, it will also ban all vehicles that do not meet advanced emission standards. BMW and Tesla are committed to setting up charging stations across China to more easily market their own electric vehicles. As part of China’s push to move 260 million people from the countryside into urban areas without exacerbating environmental problems, it is attempting to make urban areas more sustainable by adding greener sections to existing cities or building new eco-cities. In Shenzhen, the new financial district called Cloud Citizen will be a massive structure comprised of three towers that are a sustainable urban ecosystem powered by sun, wind and algae. It will harvest rainwater, and provide areas to grow food and wild plants. 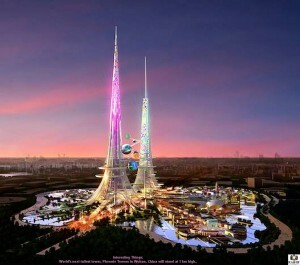 Wuhan’s Phoenix Towers will be the world’s tallest and greenest structures. A central chimney will use air passing over the lake to cool the building and turn a turbine, which, along with solar panels, will provide electricity. The outside walls will be covered with greenery to clean the air and provide habitat for indigenous species. Caofeidian, an eco-city being developed southeast of Beijing, will use 95 percent renewable energy and be carbon neutral. Tianjin’s eco-city, with energy efficient buildings and strict environmental standards, is meant to be a model for sustainable development; residents began moving in in 2012. In 2013, China was responsible for 28 percent of human generated global carbon emissions, more than the U.S. and European Union combined. Many climate scientists believe, however, that if China’s carbon emissions peak by 2025, human beings could still have a chance to stabilize the climate before the most catastrophic effects of climate change hit. On Nov. 4, China’s National Development and Reform Commission laid out a plan to cope with climate change from 2014 to 2020. It said that China will fulfill its pledges to control emissions of greenhouse gases and cut carbon dioxide emissions by 40 to 45 percent by 2020 from 2005 levels. But unless the U.S. makes stronger commitments to control its carbon emissions as well, this may not be enough.